Getting stuck in the mud or ditch is not part of the off-road experience. It kills your off-road experiences if you are stuck in the middle of nowhere with no towing company nearby. A situation like these calls for Smittybilt Winch to ensure you get out of the ditch without a hassle. Before we share with you more about these two products, let's look at how I narrowed my search to these two. Alternatively you can read best winches of 2019 here. Synthetic Rope Vs. Steel Cable: Which Way For Off-road enthusiasts. How do you know what winch to buy? IP67 or IP68, What do they mean? Will you need a battery? Choosing a winch is not something that comes naturally to the off-road enthusiast. If you are not an avid traveler, you may think any winch is perfect for you. You may not know this until you have tested the limit of your jeep if you want to choose the best winch for your truck. Here are some factors you need to keep in mind so that you can make a smart purchase. An electric is conventional and available on the market. It uses an electric motor to power the winch. Its permanent magnetic motor is light, compact, and efficient in the torque generation. The drawbacks I see with electric permanent magnet motors are, they overheat fast. While a series-wound motor, will consume more current. That said, expect your electric winch to overheat after prolonged use if you have plans to use electric winch the whole day. You may run into some serious problem with the electrical system of your vehicle. Having said that, if you find an excellent electric winch, you are good to go. A hydraulic winch is reliable, heavy-duty and resistant to fatigue. It is no surprise most off-road travelers love it because of reliability. What's more, hydraulic winch makes a perfect item for a company specializing in the rescue operation. An electric winch is an excellent choice for most people. But there's no guarantee your engine will always run during an emergency. Does that mean that Hydraulic winch has no limitation? Well, a hydraulic winch has its own set of drawbacks too. One of them is, they are few companies manufacturing hydraulic winch. Second, you have to operate them with a power steering pump, and your engine has to run for you to use the winch. Visit any off-road forum, the debate between the synthetic rope and the steel cable is one that I have never own. Since you are looking to buy only the best winch, I will give you some pointers into each. Then, you will make a decision, sounds fair? Okay, let jump. A lot of off-road enthusiasts swear by steel cable for good reasons. They are long-lasting and durable. Most importantly, allow heat to dissipate from the internal brake drum. Steel cable is cheap so that any off-road user can buy them. Besides that, there's one thing we can't ignore. You can take care and maintain with easy. Do steel cables have any drawbacks? Yes, they are a headache to handle and store more kinetic energy than their counterpart. Second, they develop barbs and rust, which can be a challenge to fix if you are in the field. A synthetic rope is an altered polypropylene material. Like the size of the steel cable, a synthetic line is light, durable, and easy to handle. Most importantly, it is not susceptible to rust like the steel cable. Unlike the steel cable, a synthetic rope won't dissipate heat that can affect brake of the winch. In terms of price, a synthetic rope is expensive compared to a steel cable. When you are buying one, avoid cheap strings you see on the market. Like the Steel cable, a synthetic rope has its drawbacks. For instance, you will need a sheath to protect it from sunlight. Before you buy your first winch, you need to know the Gross Vehicle Weight. You can easily see this on the riveted metal tag next to your driver's door. The next thing is to add the weight of your car accessories. Accessories can be anything, and it doesn't matter if it is small or big. Combine the actual Gross Vehicle Weight and the weight of any accessories to get the amount of winch you need for your vehicle. Let's say you have a 6,700-pound GVW. You will need to have a winch with a working capacity if at least 8,000 to 10,000 pounds. For ultimate safety, consider a winch that has more than 50% added pulling more than your jeep's GVW. The thing is, you might never know the limit of your jeep or truck until you get stuck in the mud. Sometimes, you can move out easily, other times. You may spend man-hours. It is the most ignored factor when it comes to choosing a winch. It is the weight on the front end of your jeep or vehicle. The logic is, you should never go a winch that weight a lot if you don't have the right suspension to support it. It will carry extra weight. For those with a synthetic rope winch, you will add extra weight to the front end of your vehicle. The weight is something in the neighborhood of 55 and 65 lbs. I know it might not sound a lot, but that extra weight may have an impact on how you pull your car out of the ditch. You need something tremendous and bigger. I know you may only use the winch one in your lifetime. You think you need something smaller to get by. Trust me on this. You need a bigger winch than you think. If you choose a big winch, you put less strain on your winch. If you are a veteran off-road enthusiast, understand that burn out of solenoid is a common failure on a winch. You can only beat that with a bigger winch. Solenoid burns out happens because the motor is drawing too much current for extended use of time. With a bigger winch, you have a longer usable time, which means chances of overheating are less. Don't think that if you buy a smaller winch, you are saving. You are doing the opposite. When your jeep gets stuck on the mud, you need lots of pulling power to get it off. Now you understand the benefit the factor you need to keep in mind when selecting a winch. 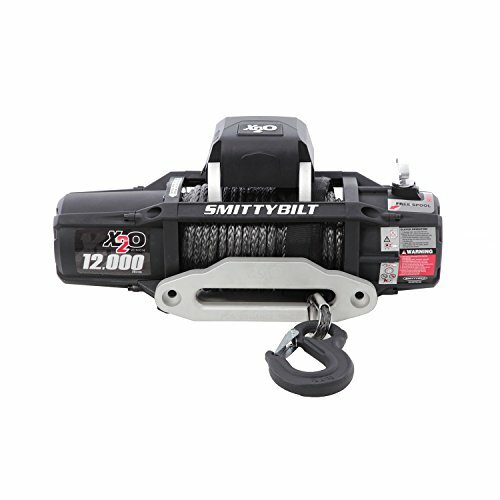 The XRC 97495 is an electrically powered winch from Smittybilt. It comes with an incredible pulling strength of 9500 pounds. That's lots of torque enough to pull a car or jeep wrangler stuck in the mud. If we look too deep, we find that its motor is amphibious with a horsepower of 6.6 and planetary systems of gear for the exceptional pulling capacity. Its waterproof abilities deserve mention. Like I said previous, it is amphibious. In other words, it keeps wet out and makes you have hopes of getting your truck out of the mud alive with no expectations of sinking. By the way, you don't have to worry how deep the mud is. The thing you need to have confidence you will get your truck out. Let's talk about its remote control? Thanks to its remote control. You will operate the winch without anxiety or fear. Yes, its gear ratio is low which means, the winding speed is super-fast, and you can control it from the parking brakes. It comes with a powerful motor of 9, 500lbs. Excellent power to pull any truck or jeep out of the ditch fast. So easy to install the XRC on your vehicle that you won't even waste more than 30 minutes of your time. Incorporates an IP67 waterproof rating to mean that you can use the winch underwater or mud. The 500 AMP solenoid makes it an excellent upgrade for anyone who has had an inferior winch in the past. Forget a mounting plate if you are going to buy the XRC. Most off-road enthusiasts know this winch for bumper and armor. If you are looking for jeep winch, pay attention to Smittybilt because of its incredible power capacity to perform its task. Besides that, the winch boosts of 6.6 HP motor, bulky enough to pull out a truck out of the hole (am kidding, it's imposing). A wireless remote is present in the purchase. That means, anyone including you, can stand at a distance and recover the jeep even in the worst terrain. Thanks to its robust magnetic drive. Honestly, how easy can that be for you? For ultimate protection, Smittybilt makes it waterproof so you can get your truck out of the mud or ditch during rain. While we are still at the topic of waterproof, I've noticed you will experience no deficiency in its performance within the first 30 comments. It's unusual, but things like this happen if you have a wrong winch for the job. You will also notice that it has a large capacity. It is great because you are going to overcome any problem that may present itself. The winch drum is a feature that deserves mention. If you are going to buy this winch. You have to know something about the winch drum. It produces less heat. To be precise, it is 50% less than most winch you see on the market. It is a great advantage to veteran off-road enthusiasts. We know you hate buying extra parts for a new device. Smittybilt understands that. That's why this winch comes with all the parts and accessories including their synthetic line that you will need for installation. How seamless and easy can that, considering that some winch is a pain to install. 3 stage planetary gear for ultimate speed. Always look at the load capacity. If you choose a winch that can't recover your jeep. Trust me on this; it would be of no use to you. You can find the GVWR of your car in two places. You can search for it online. Or you can look at your car door. If you have done the math correctly, you will find the load capacity of your vehicle and the kind of winch to buy. IP is a code that represents the International Protection Marking. The numbers that follow dictate the kind of protection for the device. For instance, an item with an IP rating of 1968 reveals the winch is dust tight with number 6 or waterproofing with number 8. You can discover the meaning of more numbers when you Google IP rating. Yes. The company recommends that you get a 650 CCA battery for its winch. Feel free to reread the Smittybilt winch review article to understand the product we've reviewed. 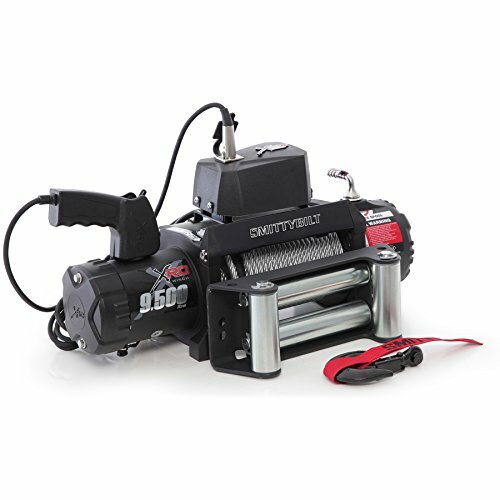 The information here will help you choose the right Smittybilt winch for your truck. But before you make any choice, make sure you measure your vehicle’s weight and tick other factors. These factors will help you choose a better winch and help you appreciate the working mechanism. Most importantly, you will save yourself years of frustration and money out of selecting a winch that will never pull your vehicle out of mud or ditch.